The Horror Section: Zombie Day In T.O. 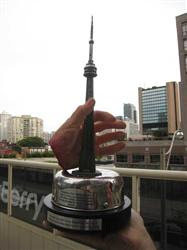 Zombies have been with us, at least in their most recognized incarnation, for over fourty years now and Toronto played host to a special set of events on Saturday. 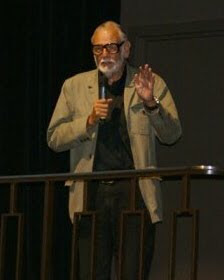 Legendary director George A. Romero was sworn in as a permanent resident of Canada this week and was honoured in front of a huge crowd at Yonge & Dundas square – the city's center! In this crowd, were hundreds of undead that had just walked – or perhaps more accurately – shambled across the city for the occasion. 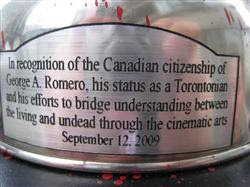 At the ceremony Romero was presented with an award, which you can see below in all its severed glory. 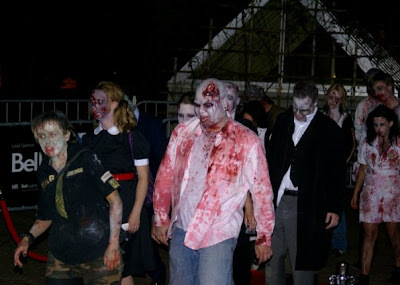 This was followed by an outdoor screening of the 1968 classic Night Of The Living Dead right in the heart of downtown. After the ceremony, the horde made their way over to the Ryerson Theatre to take in Romero's new zombie opus, Survival Of The Dead. 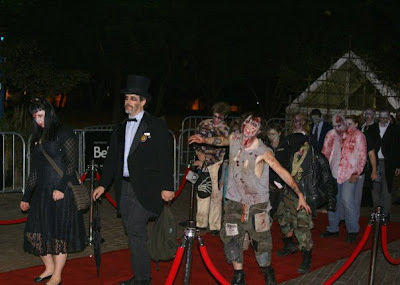 When the undead crash the red carpet, you know you are in for a wild night. All right, so onto the movie. The remaining members of a military unit headed by Crocket (Alan Van Sprang) become involved in a bitter feud between two families when they seek refuge on a secluded island. The O'Flynns feel that the undead should be put out of their misery, while the Muldoons maintain they should be kept unharmed in case a cure is discovered. I've decided, after digesting Survival for a day or so, that I come down somewhere in the middle. The movie does have some good stuff in it, including a shootout at a dock and the striking visual of a zombie riding on horseback, but these moments don't seem to come as often as they do in the other films of the series. I will say that Romero certainly hasn't run out of new and interesting ways to dispatch the walking dead though. It had a cool western vibe throughout and like Romero's last couple of projects, was infused with large helpings of humour. 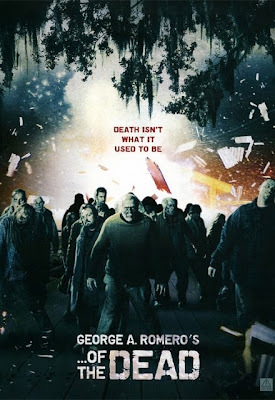 I also liked how he connected Survival to his previous film Diary Of The Dead because it gave more weight to the universe he's created here. It is pretty evident that this one could end up being the second of a possible trilogy. Romero is known for injecting subtext into his films and that is still present here, but this time it is more overt and not as cleverly presented as it used to be. Some of the dialogue in Survival seemed a little off to me and the only characters that were really able to pull it off were the feuding codgers Patrick O'Flynn (Kenneth Welsh) & Seamus Muldoon (Richard Fitzpatrick). Now matter how ridiculous it may have been, their exchanges were pretty entertaining I must admit. I seemed a lot warmer on Survival Of The Dead than many of my compatriots were after the screening, but I can relent that the quality and relevance we've come to expect from Romero is slipping with each subsequent installment. For video from the night, click here. Zombie photos courtesy of DirtyRobot.